Combine all the ingredients in a heavy nonaluminum sauce pan. Bring slowly to a boil then reduce the heat and simmer for about 10 minutes, or until the rhubarb and apple are very soft but still hold their shape. Do not allow them to turn into mush. Taste and adjust seasonings. Cool and chill before serving. Ok! Hold up...bacon jam? Do tell! Ha! Where have you been? I only mentioned the stuff about 10 times in the past few months. 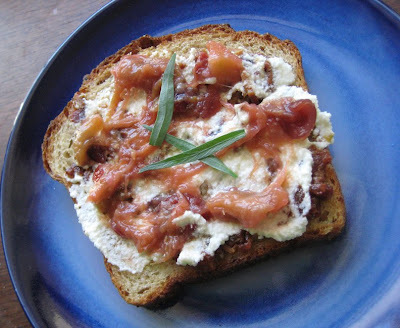 Speaking of, do you have an idea how long the bacon jam lasts in the fridge? I made some several weeks ago (it was good! ),but now I'm afraid to try it. Thoughts? Kristine - In my experience, several weeks. I made my first batch in mid-April and finished it up in late May.